Tamworth (/ˈtæmwərθ/) is a large market town and borough in Staffordshire, England, 14 miles (23 km) northeast of Birmingham and 103 miles (166 km) northwest of London. Bordering Warwickshire to the south and east, and Lichfield to the north and west, Tamworth takes its name from the River Tame, which flows through it. In 2015, it had a population of 77,157. The town's main industries include logistics, engineering, clothing, brick, tile and paper manufacture. Until 2001 it was also home to the Reliant car company, which produced the three-wheeled Robin and the Scimitar sports car. The Snowdome, the UK's first full-sized real-snow indoor ski slope is in Tamworth, and only a short distance away is Drayton Manor Theme Park. When the Romans arrived in Britain, (43–409 CE) the Trent Valley was home to the British Coritani tribe. Evidence of Roman activity in the area of Tamworth consists of fragments of Roman building materials found near Bolebridge Street. Tamworth was situated near the Roman road, Watling Street and a few miles from the Roman town of Letocetum. Following the end of Roman rule, the area around the Tame valley was occupied by Anglo-Saxons from northern Germany and Jutland. Stephen Pollington states that the settlers that reached Tamworth were Angles, who left their homelands after rising sea-levels flooded much of the land. Britain offered an attractive option as its landscape was similar to their homelands, but was more fertile and had a more moderate climate. The Angles arrived from the north, navigating inland via the River Humber, River Trent and the River Tame. The settlers established themselves in "an open meadow by the Tame" which they called "Tomworðig". Nearby they established an "enclosed estate" called "Tomtun" – Tame-town – fortified with a palisade wall. These people called themselves the "Tomsaete": Tame-settlers. Tomtun was initially "not much more than a fortified manor". The settlement straddled the River Anker and contained a "large hall for public gatherings" as well as individual homes and agricultural buildings such as stables and granaries. The Lords of Tame-Settlers quickly became wealthy and Tamworth was thus able to be fortified further. The Tomsaete were a military tribe, however, when soldiers "reached the age of majority" they retired from military duty and were then allotted parcels of land to farm, manage and defend. Fertile lands surrounding the rivers allotted first, then the hill lands; this land spreading further and further, spreading the power and influence of the tribes. The Tomsaete were one of countless tribes "all vying for power and influence", however the Lords of the Tomsaete came to control and to "dominate" the area known as English Midlands. The tribes initially ruled through unions and alliances of leading families and there is evidence of contact with families across England and also back in the Anglo-Saxon homelands. However, this "warlord" form of government developed and the Tomsaete's lands became a Kingdom with a single leader. The Tomsaete lived in the heartland of Mercia, and Tamworth was the "royal centre" under King Penda. The King was not static and would not have a single residence; instead he travelled round his territories "to be seen by his people, to give legal judgments, to reward loyalty and to try offenders". Tamworth however, was home to the King's household and children. In the reign of King Offa it was the capital of Mercia the largest of the kingdoms in what is now England (see Heptarchy). 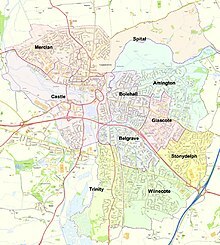 It was by far the largest town in the English Midlands when today's much larger city of Birmingham was still in its infancy. This is largely due to its strategic position at the meeting point of the rivers Tame and Anker, placing the town perfectly as a centre of trade and industry. The town was sacked by the Danes (Vikings) in 874. It remained a ruin until 913, when Æthelflæd, daughter of King Alfred the Great and Lady of the Mercians, rebuilt the town and constructed a burh to defend it against further Danish invaders. She made Tamworth her principal residence and died there in 918. In Tamworth church in 926, a sister of King Æthelstan, perhaps Saint Edith of Polesworth, was married to Sitric Cáech, the squint-eyed Norse King of York and Dublin. In the 11th century, a Norman castle was built on the probable site of the Saxon fort which still stands to this day as an important tourist attraction. Grants of borough privileges, including rights to a third additional fair in 1588 consolidated Tamworth's historic importance as 'the seat of Saxon kings'. In the Middle Ages Tamworth was a small market town. However the king gave it charters in 1319. In 1337 Tamworth was granted the right to hold two annual fairs. In the Middle Ages fairs were like markets but they were held only once a year and they attracted buyers and sellers from great distances. In 1345 Tamworth suffered a disastrous fire, and much of the town burned. However, the town was soon rebuilt and grew in size. Queen Elizabeth granted Tamworth another charter in 1560. Tamworth suffered from outbreaks of plague in 1563, 1579, 1597–98, 1606 and 1626. Many died but each time the population recovered. 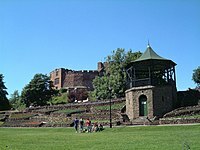 James I, the first Stuart king of England, visited Tamworth in 1619 and was accommodated by Sir John Ferrers at Tamworth Castle. The Prince of Wales (the future king Charles I) was entertained by William Comberford at the Moat House. 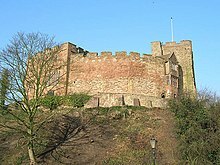 Tamworth castle was besieged by parliamentarian forces during the English Civil War in 1643. An order was issued for the castle to be destroyed but this was not carried out. Tamworth continued to grow and remained one of the most populous towns in the Midlands by 1670, when the combined hearth tax returns from Warwickshire and Staffordshire list a total of some 320 households. Its strategic trade advantage lay with control of the two vital packhorse bridges across the Anker and the Tame on the route from London to Chester. While it remained a local market town, it did a brisk trade providing travellers with the staple bread, ale and accommodation, maintaining trading links as far afield as Bristol. Charles II's reconfirmation of its borough's privileges in 1663 gave the town an added boost, as confirmed by Richard Blome's[who?] description of its celebrated market, well served with corn, provisions and lean cattle. In 1678 the town's future Member of Parliament Thomas Guy founded almshouses in Tamworth, rebuilt in 1913. He also built Tamworth Town Hall in 1701 and later founded Guy's Hospital in London. There are four cannon in the Castle Grounds, an indication of the town's previously violent past. In 1801, the population was a little over 3000. There were a number of improvements to Tamworth during the 19th century. In 1807 the pavements were flagged. From 1835 Tamworth had gaslight. In the late 19th century a piped water supply was created. The town grew rapidly in the 18th and 19th centuries during the Industrial Revolution, benefiting from the surrounding coal mines. It also became connected to the canal network, with the Coventry Canal being built through the town. Later, the railways arrived with the Midland Railway route from Derby to Birmingham arriving in Tamworth in 1847, and later the London and North Western Railway, which provided direct trains to the capital. A split-level station exists where the two main lines cross each another, the higher level platforms (on the Derby to Birmingham line), being at right angles to the lower ones on the main line to London. The first municipal cemetery opened in 1876. The Assembly Rooms were built in 1889. In 1897 the corporation bought Tamworth Castle. A hospital was built in Tamworth in 1880 and was funded by one of the town's greatest benefactors, William MacGregor, at his own expense. An infirmary was built in 1903. MacGregor also built two churches at Glascote and Hopwas and had the bells at St.Editha's church recast. He also started a free library, a working men's club, a school (Now called William MacGregor School) and started the Co-operative societyin the town in 1885 acting as guarantor. 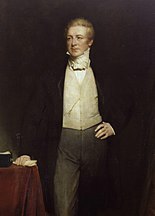 The Victorian Prime Minister Sir Robert Peel served as the town's Member of Parliament from 1830 until his death in 1850. He lived at the nearby Drayton Manor. 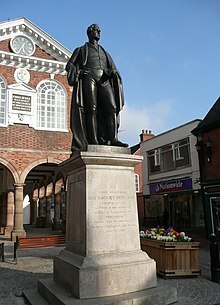 It was in Tamworth that Robert Peel unveiled his Tamworth Manifesto in 1834 which created what is now the modern Conservative Party. While Home Secretary, Peel helped create the modern concept of the police force, leading to officers being known as "bobbies" (in England) and "Peelers" (in Northern Ireland). During the 19th century a breed of pig called Tamworth Pig was initially bred here using some imported Irish stock. Sir Robert Peel was a member of the historic Tamworth Castle Bowls club, founded in 1814, which still has an active membership. Samuel Parkes who won the Victoria Cross in the Charge of the Light Brigade was born in Wigginton and baptised at St. Editha's on 24 December 1815. His parents, Thomas and Lydia, are buried in its churchyard. The first council houses in Tamworth were built in 1900. More were built in the 1920s and 1930s and after 1945. The first public library in Tamworth was built in 1905. Tamworth gained an electricity supply in 1924. Tamworth grew rapidly in the postwar years as it soaked up overspill from the West Midlands conurbation to the southwest. A population of about 7,000 in 1931 had risen to some 13,000 just after the Second World War; this figure remained fairly static until the late 1960s when a major expansion plan was implemented. Although not officially a "New Town", Tamworth's expansion resembled the development of many new towns. As part of this plan the town boundaries were expanded to include the industrial area around Wilnecote to the south. The 1961 population of the new enlarged area was 25,000. In 1971 it was 40,000; in 1981, 64,000; in 1991, 68,000 and in 2001, 72,000, meaning that the town's population had almost doubled within 30 years. The town of Fazeley merges almost completely into the town to the southwest, but belongs to the Lichfield District area rather than Tamworth Borough. It became a town, after a referendum on a choice to merge with Tamworth. Tamworth was historically divided between Staffordshire and Warwickshire, with the county boundary running through the town centre. The boundary was re-drawn in 1888, with the town placed entirely in Staffordshire. The Reliant Motor Company was founded in Tamworth in 1935 by T. L. Williams and E. S. Thompson, and cars such as the Scimitar four wheeled sports cars and the Robin three wheeled economy cars were manufactured here until the company moved to Cannock in 1998. A year later the old factory was razed to the ground and a new housing estate built in its place called "Scimitar Park" with street names assuming names of Reliant vehicles (i.e. Robin Close). The A5 dual-carriageway Fazeley, Two Gates and Wilnecote Bypass opened in July 1995, acting both as a bypass of Watling Street, and as a fast route for traffic into the town. This was further extended to meet the M6 Toll and A38 in 2005. The road's official name is Thomas Guy Way. Tamworth has six designated Local Nature Reserves, Hodge Lane (Amington), Kettlebrook, Tameside, Dosthill Park, Warwickshire Moor and Broadmeadow, which became the newest nature reserve in April 2013. According to the 2011 census the borough of Tamworth has a population of 76,900. White British is by far the largest ethnicity, making up 97% of the population. The second largest ethnicity is White Irish, making up 0.9% of the borough's population. 95% of people in the borough were born in England, with Scotland being the second largest making 1% of the population. Tamworth was in 2013 the most overweight town in the UK with a 30.7% obesity rate. Tamworth Borough is administered by Tamworth Borough Council. Tamworth Borough Council has been Conservative controlled since 2004, but was Labour-controlled from the early 1980s. At the last election, May 2016, the Conservative Party held the borough. The council is now made up of 20 Conservatives, 7 Labour and 3 UKIP councillors. No part of the borough has a civil parish. The current Mayor of Tamworth is Councillor Peter Thurgood. On Staffordshire county council, Tamworth has six divisions, all of which are held by the Conservatives. Since 2011, Tamworth has formed part of the Greater Birmingham & Solihull Local Enterprise Partnership along with neighbouring authorities Birmingham, Bromsgrove, Cannock Chase, East Staffordshire, Lichfield, Redditch, Solihull and Wyre Forest. Tamworth is also a non-constituent member of the West Midlands Combined Authority. The council has a cabinet system of governance, the Leader of the council is Cllr Daniel Cook and the Deputy Leader is Cllr Robert Pritchard. Tamworth Council elects by thirds. Meaning there is an election of 1 councillor for each of the 10 wards over a three-year period. The fourth year see elections to Staffordshire County Council. Councillors are elected for a four-year term. All of Tamworth Borough is in the Parliamentary Constituency also called Tamworth and it is currently represented by the Conservative Christopher Pincher, who has held the seat since the 2010 election. Tamworth has a minor hospital called Sir Robert Peel Hospital which is located in Mile Oak. Sir Robert Peel Hospital does not have accident and emergency facilities, which are provided at Good Hope Hospital in Sutton Coldfield. Tamworth is part of the South Staffordshire and Shropshire Healthcare NHS Foundation trust. Christianity is the largest religion in Tamworth, comprising 77% of the population. 15% are not religious. Other religions include Hindu (177), Islam (127) and Sikhism (124) which make up 0.9% of the population. The main church in Tamworth is Church of St Editha in the town centre. 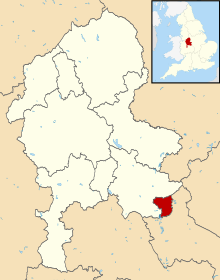 Most of Tamworth is part of the Diocese of Lichfield, the two parishes being Tamworth and Wilnecote. However Amington is in the parish of Amington St. Editha which is part of the Diocese of Birmingham. 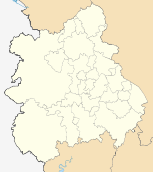 Tamworth is in the Roman Catholic Archdiocese of Birmingham; the main Roman Catholic church is St John the Baptist on St John Street in the town centre, the other Roman Catholic church is Sacred Heart Church in Glascote. Sir Ernest William Titterton was born in Tamworth. He was a research officer for the British Admiralty during World War II before becoming in 1943 a member of the British mission to the U.S. to participate in the Manhattan Project which developed the atomic bomb. He was knighted in 1970. Former The Teardrop Explodes frontman and solo artist/writer Julian Cope was raised in Tamworth and later lived in nearby Drayton Bassett. Cope recorded three solo albums during his Tamworth years, World Shut Your Mouth (1984), Fried (1984) and Saint Julian (1987), and all three used various locations around Tamworth for their sleeve art and several videos. The heavy rock band Wolfsbane cut their teeth in the town, before their lead singer Blaze Bayley went on to front the legendary Iron Maiden. 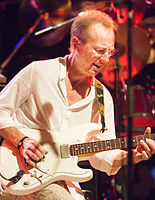 Rock guitarist Clem Clempson was born in Tamworth. Bob Catley the lead singer of rock band Magnum (band) also lives in Tamworth. 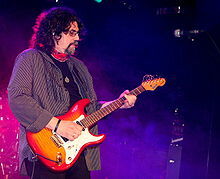 Guitarist/vocalist/songwriter/ producer Phil Bates (Trickster, ELO Pt2, Quill and solo artist) was born in Tamworth, and played in local bands the Teenbeats and Source of Power until moving away from the area in 1971. Phil still has strong family and musical connections with Tamworth. Tamworth has an active music scene, which circulates to some degree around The Skull Club and Tamworth Bands (also known as 'Tambands') websites. The main road running through Tamworth is the A5 bypass. The M42 motorway runs to the east of Tamworth and the town is served by junction 10 which also contains Tamworth services. The Egg is a magic roundabout in Tamworth, Staffordshire at its heart. The Egg forms the junction of the A51, A453 and A513 and terminates the B5000. It consists of the roads Ankerdrive and Bolebridge Street, and is listed as being part of the A51. The Egg has a cinema complex and restaurant in the centre, and has the River Anker running through it. The Snowdome and Tamworth FC also directly adjoin the junction. The Egg was voted the fourth worst roundabout in Britain in 2005. Tamworth railway station located on Victoria Road serves the town. 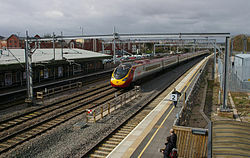 Tamworth Station is a high- and low-level station and serves as an interchange between the West Coast Mainline and the Cross Country Route. A smaller station called Wilnecote railway station on the Cross Country Route serves the suburbs of Wilnecote and Two Gates. The nearest airports to Tamworth are Birmingham Airport and East Midlands Airport. Tamworth currently has two historical blue plaques. The first is postioned on the old Bank House on Lady Bank by the Tamworth Civic Society and commemorates the Tamworth Savings Bank that was founded on 1823. More recently on 8 July 2017, a blue plaque was unveiled by Tamworth Heritage Trust and the Reliant Motor Club at Bro-Dawel on the Kettlebrook Road to honour Reliant's founders, Mr T. L. Williams and Mr E. S. Thompson, and marks the birthplace of the first Reliant prototype built in 1934. One of the more notable personalities to come from Tamworth is former Manchester City goalkeeper Tony Coton, who made a number of appearances over the years. Tamworth F.C. has also fielded a number of notable players in recent times, including West Brom legend Bob Taylor and, for one match in the 2005–06 season, former Aston Villa and Arsenal midfielder Paul Merson. Tamworth F.C. showed signs of progress, just surviving to get their third season in the Conference, playing teams such as Halifax Town, Oxford United & Kidderminster Harriers on a regular basis. The club also has a keen rivalry with fellow Staffordshire clubs Stafford Rangers and Burton Albion. However, their biggest rivals are Nuneaton Town. In 2009, as winners of Conference North, Tamworth were promoted to the Conference Premier. Other football players from Tamworth include goalkeeper Martin Taylor who played for Derby County and Wycombe Wanderers, and current Wales international Ashley Williams who plays for Everton in the Premier League. Leicester City footballer Marc Albrighton is also from Tamworth. Tamworth Castle Bowling Club was founded in 1814 it can boast Mayors and Prime ministers as past members. This crown green bowling club is situated behind a green door on Ladybank in the shadow of Tamworth Castle. The club is owned by its membership with a season running from March to October. Tamworth and District Indoor Bowling Club officially founded and opened in 1990. A fire destroyed the Club just after it was originally built delaying its opening by about 12 months. This is the only indoor bowling club in Staffordshire and with over 350 members it is actively involved at Club, County and National levels of competition. There is an active junior section with County representatives to under 25 age group. Bowling for people with disabilities is a very important part of the Club as is coaching for all players. Owned by its membership the Club has an Outdoor green operating April to September whilst the Indoor rinks are open throughout the year. The Club is in Eagle Drive, Amington, Tamworth just before the Municipal Golf Course. Speedway racing took place in the Tamworth area in the 1930s and in the post war era featured at the Greyhound Stadium in Mile Oak. The Hounds started out in 1947 racing in the National League Division Three before becoming The Tammies in 1950 when the venture was purchased by Birmingham promoter Les Marshall. There are five secondary schools in Tamworth, a sixth form centre and a branch of South Staffordshire College along with 27 primary schools. In 1868 The Tamworth Herald was launched by Daniel Addison, with its original premises in Silver Street. Mr Addison continued to publish the paper for nine years until 29 October 1877, when it was taken over by a consortium of leading townsmen. The paper now has offices on Ventura Park Road, where it remains to this day. Its Tamworth-based reporters also contribute local news stories to the Birmingham Mail's website, Birmingham Live in addition to their print based activities. The Tamworth Herald was crowned ‘Newspaper of the Year’ at the Midland Media Awards in both 2016 and 2017. Daniel Addison had a son Albert Christopher Addison who was a historical writer. In 2013 Tamworth Informed, a local Facebook Page was launched to bring news to local residents. In 2014 this developed into a website and a mobile app was also launched. Tamworth Informed remains the only local news service in the area that is recognised by Apple for their news service. Touch Radio (Burton, Lichfield and Tamworth) is the local commercial radio station; it broadcasts from the nearby Lichfield transmitting station. The BBC Local Radio station covering Tamworth is BBC WM which has its studios in Birmingham. Community station Total Choice Radio (known as TCR fm) served the Tamworth area but this came to an end in October 2017. It was however announced shortly after that there would be a replacement Community Radio service in Tamworth; this received the support of the Mayor at the time, Cllr John Chesworth. Tamworth lies in the BBC West Midlands and ITV Central television regions. 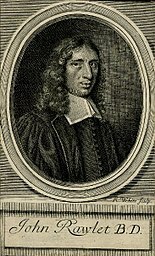 Thomas Blake (c.1597-1657) English Puritan clergyman, controversialist of moderate Presbyterian sympathies. William MacGregor (1848-1937) Egyptologist, magistrate, Chairman of Tamworth Herald 1906-1928 and Tamworth benefactor. Sir Ernest Titterton CMG FRS FAA (1916–1990) was a British nuclear physicist. Jemma Palmer (born 1986) an English model and professional wrestler, signed to WWE. Hubert Pearson (1886–1955) goalkeeper, 341 appearances for West Bromwich Albion F.C. Harold Pearson (1908–1994) goalkeeper, over 300 pro appearances mainly for West Bromwich Albion F.C. Albert Mullard (1920–1984) prisoner of war and footballer, played almost 300 pro games mainly for Port Vale F.C. Cyril Beech (1925–2001) footballer, made 172 pro appearances mainly for Swansea Town F.C. Roger Brown (1952–2011) football manager and player, made over 300 pro appearances mainly for Fulham F.C. Peter Eastoe (born 1953) former footballer, 350 pro appearances mainly for Everton F.C. Steve Fox (1958–2012) footballer, made 278 pro appearances mainly for Wrexham F.C. Tony Coton (born 1961) former footballer, goalkeeper. 501 pro appearances mainly for Watford F.C. Dan Martin (born 1986) Irish professional racing cyclist. Marc Albrighton (born 1989) English professional footballer, plays for Leicester City F.C. ^ a b c d e Pollington, Stephen (2011). Tamworth: The Ancient Capital of Mercia. ^ Higham, N. J.; Hill, David (2001). Edward the Elder, 899–924. Routledge. ISBN 978-0-415-21496-4. ^ "Part 2: A.D. 750 – 919". Anglo-Saxon Chronicle. King Alfred. pp. A.D. 913, 918. Retrieved 26 August 2013. ^ Smith, Christine. "Who Was St. Editha?". Archived from the original on 19 October 2012. Retrieved 23 February 2012. ^ "Sihtric (Norse King of York)". Medieval People. TimeRef. Archived from the original on 24 May 2012. Retrieved 23 February 2012. ^ Payne, Elvis (2016). The Reliant Motor Company. Crecy Publishing. ^ "Wild about Tamworth". Tamworth Borough Council. Archived from the original on 28 September 2011. Retrieved 28 January 2011. ^ "Tamworth Ethnicity". Office for National Statistics. Retrieved 21 April 2012. ^ "Country of Birth Tamworth". Office for National Statistics. Retrieved 21 April 2012. ^ Bosely, Sarah (18 February 2013). "Obesity fightback begins in Tamworth, fat capital of Britain". The Guardian. London. ^ "Tamworth Historic Election Results" (PDF). ^ "Councillors | Tamworth Borough Council". www.tamworth.gov.uk. Retrieved 31 August 2016. ^ "Mayor | Tamworth Borough Council". www.tamworth.gov.uk. Retrieved 31 August 2016. ^ "Election results by Divisions,4 May 2017". 4 May 2017. Retrieved 5 May 2017. ^ "West Midlands Combined Authority - Who's included?". westmidlandscombinedauthority.org.uk. Retrieved 17 November 2016. ^ "Committee structure". 17 November 2016. Retrieved 17 November 2016. ^ "Committee details - Cabinet". 17 November 2016. Retrieved 17 November 2016. ^ "Election news | Tamworth Borough Council". www.tamworth.gov.uk. Retrieved 17 November 2016. ^ "Nearest hospital to Tamworth". National Health Service. Retrieved 23 April 2012. ^ "Religion in Tamworth". Office for National Statistics. Retrieved 21 April 2012. ^ "Community radio in Tamworth is not ending". Tamworth Informed. 22 October 2017. Retrieved 1 November 2017. ^ "Mayor of Tamworth backs Local Radio". Tamworth Informed. 1 November 2017. Archived from the original on 7 November 2017. Retrieved 1 November 2017. J. Gould, "The Medieval Burgesses of Tamworth: their Liberties, Courts and Markets", Transactions of the South Staffordshire Archaeological Society, No. 13 (1971–72). Wikivoyage has a travel guide for Tamworth.